A collection of finished bags. Donna Pontius shares a chuckle with the ladies; she introduced the idea to the group. Plastic grocery bags are everywhere. 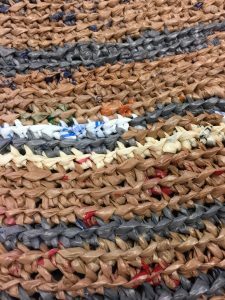 While many of us try to reuse or recycle them, lots of bags end up polluting ditches, clinging to fence rows, or blowing in the breeze like plastic tumbleweeds. Even the companies who do curbside recycling don’t like them, because they gum up mechanical recycling machinery, which can shut down a whole plant. 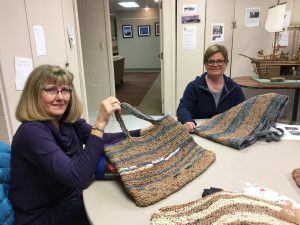 A group of ladies at the Life Enrichment Center in Plymouth, Indiana have found a way to reuse plastic grocery bags by crocheting them into durable reusable bags. 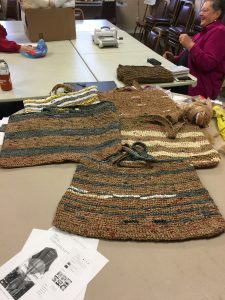 They start by cutting the bags into one-inch strips and tying them together to create their “yarn.” Then it’s just a matter of crocheting them with the same type of hook used for conventional threads. 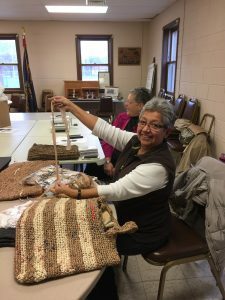 Donna Pontius first brought the pattern to the group, who also gathers to crochet other projects together. The ladies have also collaborated by sharing design ideas. They have a somewhat limited palette, depending on which stores they frequent. Brenda Newcomer (left) and Nancy Sumpter demonstrate their designs. “This is an old Walmart bag,” said Nancy Sumpter, pointing to a gray stripe on the bag in front of her. “This is Martins, this is new Walmart.” They even “import” bags from other communities to introduce new color schemes into their designs. One member’s son brings her bags from his Lafayette grocery store. Do you have extra bags? Consider donating them to these ladies’ collection. New colors welcome! 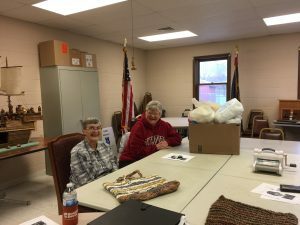 Mary Smith (left) enjoys crocheting bags; Glenda Anderson does her part by donating them. Bags from Walmart, Martins, and other stores mingle in the designs.